HOW TO DECORATE SMALL SPACES WITH ART? Milica Jovic is a contributing writer for Highlark and Art Acacia Gallery & Advisory. Many think that tiny apartments and houses are the future of urban living. As an increasing number of people are moving to big cities for work, the apartments we live in are getting smaller and smaller. It can be difficult to decorate small living areas, as they do not offer the space or the functionality of larger places. But with the right strategy, you can design a home that’s both functional and stylish. One way to decorate a tiny room is by selecting one large statement piece to be the focal point of the design. Hang a big, bold piece on a prominent place, above the sofa or a dining table. Then select less conspicuous furniture to make the room look less crowded (like small coffee tables and bar stools). Opting for one big statement piece is a great way to add character to your small apartment and show your guests that you are not afraid of taking risks. 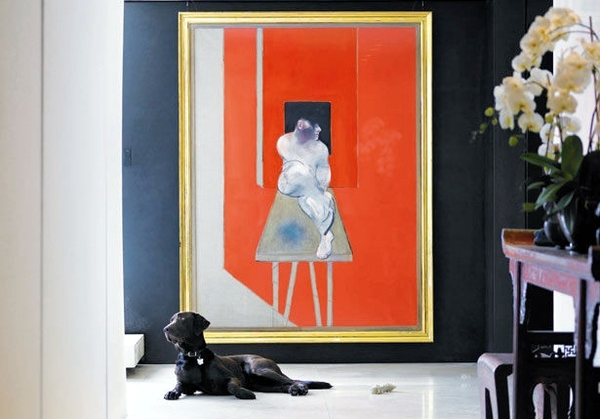 If large statement pieces are not your cup of tea, you can always opt for several smaller artworks. Small-scale artworks have a unique ability to create a warm, cozy atmosphere and make any place feel like home. Also, small-scale artworks are rather convenient, since you can always find room for a nice miniature. Why not pick a humorous drawing for a tiny corner or interstice to brighten up the place? While large abstract pieces look great when seen from afar, more detailed artworks often require a closer inspection. That makes detailed artworks ideal for small apartments where people are naturally located in close proximity to the displayed art. Living in a tiny home will allow you to really enjoy the details of the artwork while resting on the sofa. Most people place art in their living room, dining room or the hallway, but when living in a small apartment you have to use every little bit of free space you got. If you have some space on your bathroom wall, why not place an artwork there? Or place some art on your coffee table or on an empty place on your bookshelf. Also, computer screen or a big screen TV can be used to display video art or digital art, when not used for other purposes. Who said that art has to hang on the walls? When you live in a small space, you have to find creative ways to exhibit your art. If you have a collection of artworks of similar style or genre, you can use them to create a mini gallery in your home. Instead of hanging art pieces separately, group them together. Display several coherent pieces in one place, one above the other or right next to the other. You can place nine artworks in three rows to create a grid. Or place them all in one vertical line to form a column. Gallery view will bring the sensation of rhythm and symmetry into your home. Paring two artworks of different sizes together will help you strike a balance and add depth to your room. Choose two complementary pieces, where one piece will accentuate the beauty of the other. There’s nothing more boring than a plain, white wall. Make it more interesting by hanging a colorful, vibrant print. This will add a touch of color and joy to your living area. Also, it will distract the viewers from realizing how small your apartment really is. If you live in a small apartment with dark walls, you should opt for lighter colors and simple motifs. A great way to decorate a darkly painted room is by using bright, black and white photographs or plaster sculptures to make the art really pop. When decorating small spaces, it’s important to remember that every room has six walls. And that you should embellish them all. The ceiling or even the floor can be decorated with wonderful murals. Custom made wall art can be an excellent conversation starter that will both mesmerize the guests and open up the place. Small spaces can often seem claustrophobic. One way to make a place look more relaxing is by filling it up with art that has natural motives. Choose flower paintings or landscapes to achieve a visually exciting and organic feel. A bunch of vivid natural motifs will make you feel like living outdoors and not in a cramped, box-like apartment. Remember, just because you live in a small apartment doesn’t mean you have to expel art from your home. The right artwork can make the place look bigger while showing off your good taste in art. Despite their small size, micro-apartments still offer plenty of room for experiment, and elegant, creative solutions. Limited Edition Prints: Are They Worth Anything?